While Apple was busy focusing on how the newest iPad is even thinner than its pencil-thin predecessor and how the bonded display makes the pixels look as if they live right on top of the display, the real iPad Air 2 was flexing its muscles behind the curtains. Make no mistake: the iPad Air 2 isn't about being pretty, even though it has a beautiful display. It's not about being thin, even though it went from 7.5 millimeters to 6.1 millimeters. The new iPad Air 2 is about being powerful. Perhaps the oddest thing about the 5-star iPad Air 2 is how Apple introduced it as a 4-star tablet. After a short film about how they made it so thin and an inordinate amount of time spent on the new back-facing 8 MP iSight camera, Apple flashed a graphic about the new iPad having 40% more performance and 250% more graphical performance and called it a day. But there's much more to know about the iPad Air 2. The newest iPad on the block is powered by an A8X system-on-a-chip (SoC). By comparison, the new iPhone 6 and iPhone 6 Plus are powered by an A8 chip, and when Apple adds an X onto the end of a chip name, it is usually more than just a slight boost in speed. The A8X chip takes the 1.4 GHz Dual-Core A8 and turns it into a 1.5 GHz Tri-Core A8X. That's a significant jump in processing potential and explains why Apple thought enough of it to throw that extra "X" on the end. How fast is the iPad Air 2? While Apple claimed it was 40% faster than the iPad Air, Geekbench gives it a multi-core score of 4438 compared to the iPad Air's 2663. That makes it about a 65% jump in potential speed. And when you consider an entry-level MacBook Air with a dual-core i5 processor scores around 5300 on the same benchmark, it is easy to see how close the iPad comes to reaching laptop performance. Apple also paired that boost in performance with 2 GB of RAM, up from 1 GB found in the iPad Air and the iPhone 6/iPhone 6 Plus. The extra memory will give the iPad more elbow room when running multiple apps or when using iOS 8's new extensibility feature, which lets a piece of an app run within another app. But the hidden truth here is the departure from the iPhone model. Until now, the iPad has been released with similar specs to the latest and greatest iPhone. The iPhone usually gets fancy new features (Siri, Touch ID) first, and still has the best cameras, but with the iPad Air 2, Apple is differentiating its tablet lineup from its smartphone lineup. More power being added to the iPad could also open up new features such as running multiple apps side-by-side. If the only thing Apple added was a Tri-Core processor and an extra GB of RAM, the iPad Air 2 would be a beast. But Apple made just about every single part of the iPad experience better with the Air 2, which is why it is the only full-sized iPad to get my 5-star rating. The iPad Air 2 is a little thinner and weighs slightly less than its predecessor. In fact, at 0.963 pounds, the iPad is now officially under the 1 pound mark. Apple was able to achieve this in part through a process of optically bonding the display, eliminating a small layer of air. The one downside of this process was a slight loss in the full range of color offered by the iPad Air 2 compared to last year's iPad, though very few people will actually notice the difference. What is noticeable is the new anti-reflective coating, which leads the industry for tablets and makes outdoor use easier. In fact, the iPad Air 2 was twice as efficient in this category than the best of the competition. The iPad Air 2 also jumps from a back-facing 5 MP iSight to an 8 MP iSight camera. This still isn't as good as the iPhone 6 or 6 Plus, but it is close to the quality of the iPhone 5S. With the image and video editing capabilities of the iPad combined with new features like time-lapse video and burst photos, the improvement in the camera makes a lot of sense. And the obvious difference between the Air and the Air 2 is the inclusion of Touch ID, the fingerprint sensor that allows you to unlock the tablet and make App Store and iTunes purchases with your thumbprint. This also enables the iPad Air 2 to make Apple Pay payments, though this is an online-only feature. The iPad Air 2 doesn't include the near field communications (NFC) required to make purchases in an actual store. Last, the iPad Air 2 supports the new 802.11ac Wi-Fi standard. Of course, the iPad is backward compatible with 802.11 a/b/c/n, but if you have one of the new 802.11ac routers, this can make a big difference. A big change in the new standard is the ability for the router to form 'beams' to help connectivity in areas where the old standards might cause difficulty in connecting, so if you've always had problems connecting your iPad to the Internet in certain rooms in your house, the iPad Air 2 combined with a new router that supports 802.11ac might be the solution. 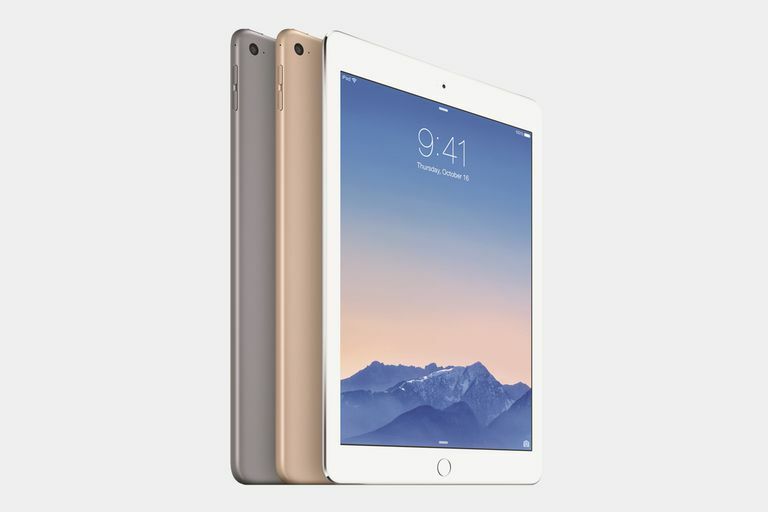 The iPad Air 2 signifies a huge boost in performance and is better than its predecessors in just about every category. Furthermore, it races past the competition, with the new A8X processor significantly faster than competing Android tablets. With performance closing in on a laptop, cameras as good as a smartphone and the incredible new features of iOS 8, it's a great time to jump on the iPad bandwagon. The iPad Air 2 is easily Apple's best tablet, but if you own an iPad Air or an iPad 4, there's no reason to upgrade just yet. Likewise, the iPad Mini 2 is really an iPad Air in a smaller size, so unless you really want to jump to the bigger size, you should be fine. Owners of older iPads like the iPad 2 and iPad Mini may want to seriously consider the iPad Air 2.